If you’re looking for a way to reduce your carbon footprint (and the cost of your energy bill), you’re not alone. 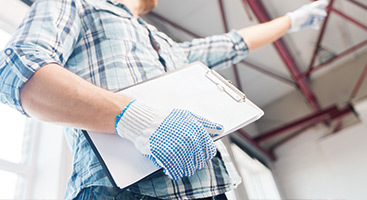 Homeowners all over Cleveland are always asking us about ways to make their appliances more efficient, and one of the biggest offenders of energy consumption is your refrigerator. Most people don’t think about it, but this is an appliance that is using energy 24 hours a day, seven days a week. This means that if you’re trying to enhance the energy efficiency of your home, the fridge is a great place to start. Chances are, you haven’t given much thought to the rubber seal on your refrigerator, but it plays a critical role in the efficiency of your fridge. This lining, which is also called a gasket, prevents warm air from getting into your refrigerator. Over time, as the door is opened and closed, again and again, gaskets tend to lose their suction abilities. It’s typical for gaskets to tear or wear down within the first few years of owning your fridge. As this happens, your fridge has to work harder to operate, which leads to higher energy bills for you. If you have had your refrigerator for a few years and you have seen a spike in energy usage, it’s time to replace the gasket. Your refrigerator is constantly working to keep your food safely chilled, and if it is near high heat, it has to work twice as hard to do so. 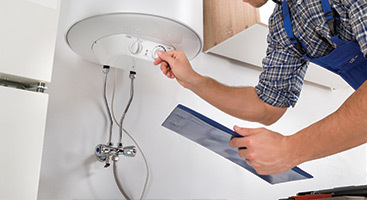 This can even shorten the life of your appliance over time. This is why, when you’re designing your kitchen, you should not put your fridge anywhere near the range, oven, or dishwasher. You should also avoid putting it in direct sunlight. The condenser coils of your fridge are located on the bottom of the unit and are designed to remove warmth from the appliance. Over time, they start to get dusty, which then causes it to be much more difficult to operate effectively. The work these coils have to put in overtime can cause the energy bills to skyrocket and may shorten the lifespan of the unit. Fortunately, this is an easy problem to fix. Simply use a bristle brush to dust away the dirt and debris that have accumulated under your fridge anytime it seems that its performance has suffered. This is a small but impactful way you can save your fridge from overworking. After you have finished a meal, give your leftovers some time to cool to room temperature before you put them in the fridge. This way, you are adding less heat into your fridge for it to compensate for. Just be sure to not let your food sit for too long, as this can cause it to spoil if you aren’t careful. This might seem obvious, but it is one of the most impactful ways you can save on the energy costs associated with your fridge. Keep your fridge door closed as much as possible, and don’t spend too much time standing in front of it with the door open. As the cold air escapes from your fridge, it needs more energy to keep the food inside cool. Decide what you want to eat before you open your fridge to save from letting too much air escape. When’s the last time you organized your fridge? If it’s been awhile, you might be wasting quite a bit of energy. If you are spending a lot of time standing with the door open, trying to locate something, you are letting out all the cool air in your unit. If your fridge is well-organized, you can easily get in and out without having to waste precious energy. In addition, be mindful about the amount of food on the top shelf of your fridge. Use the top shelf for your most frequently used items, so you can simply grab them and close the door quickly. Also avoid putting very large objects on the top shelf of your unit, as this can trap the heat inside your fridge. 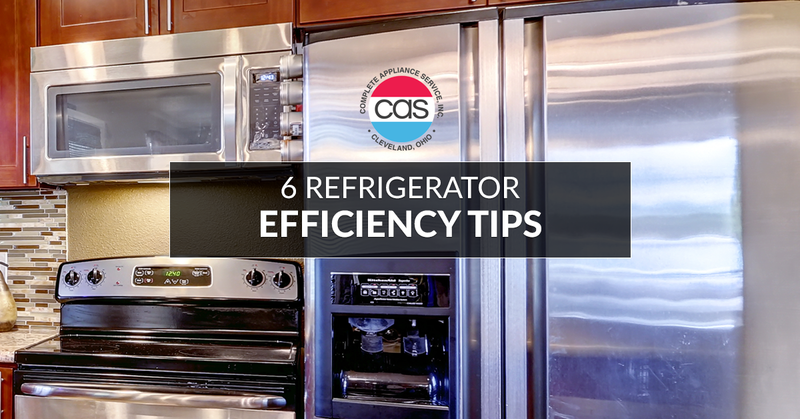 We hope that these tips help you make your fridge the most efficient it has ever been. 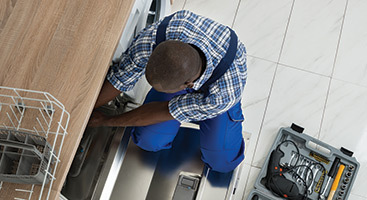 If you are still struggling to make your refrigerator more efficient, it might require repair. If this is the case, you’ve come to the right place! 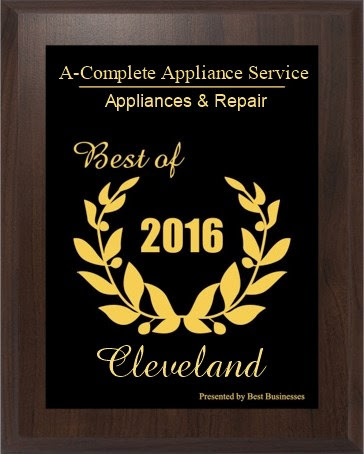 At Complete Appliance Service, we offer the most reliable refrigerator repair in Cleveland. Contact us today to get started!